After 50 years on stages all around the world, Germany's Scorpions decided in 2010, it was time to embark on one last final tour. The tour would last for three years and span the globe. This fully authorized documentary follows the band from their beginnings as young players struggling to make ends meet, up to the present day. This is a double DVD. The first DVD documents the history of the band from their early beginnings right up until their world farewell tour which ran from 2010 until 2012, but despite a few moths rest, an album release, they hit the road again, only to finally call it a day back in May after a residency at the Hard Rock Hotel in Vegas. Will they be back? Who knows. This footage, in hindsight marks the farewell of drummer James Kottak, due to ill health, who has recently been replaced with Mickey Dee, formerly of Motorhead. We follow the Scorpions around the touring circuit while both past and present band members, plus other key crew personal tell how the group got started, how they got their early chances, like winning a talent show but later getting disqualified for being too loud, and then finally how they broke through to international stardom, while still being largely ignored in their home country. There are the expected appearances from ex-Scorpions members, Michael Schenker and Herman Rarebell. Legendary producer Dieter Dierks, whose name is goes hand in hand with the band, also makes a welcome appearance. The film also chronicles how they were often one of the first rock bands to play in the Far East, Eastern Europe and Russia. Mikhail Gorbachev even took time out from being the first president of the Soviet Union to invite the Scorpions to play in Russia. The documentary is filmed in German, with English sub titles, but that doesn’t distract from the overall enjoyment of the film. There are many funny moments in it, and some great archived footage, however it wouldn’t be fair to share them with you out of context, so you’ll just have to buy it. The second DVD documents their final live show from Munich’s Olympic Hall in Germany on December 14, 2012. 15,000 people witnessed the Scorpions perform their greatest hits, and it is captured beautifully here, masses of cameras follow the band around on stage, and quick editing keeps the momentum high. 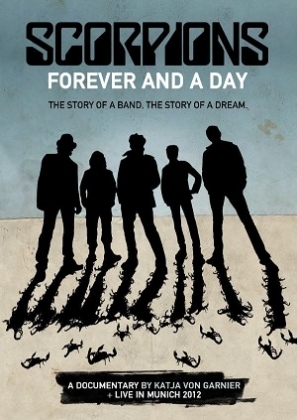 "Forever And A Day" is a fascinating look at one of Rock's most successful and long lasting bands, knocking on 50 years and selling in excess of 100 million albums………………I will just let that sink in…………………..this addition of the fantastic final live concert makes this an essential purchase for any Scorpions fan.